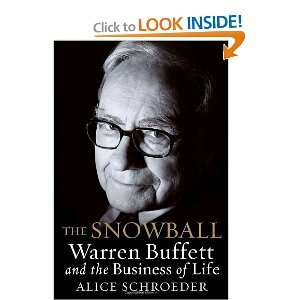 Warren Buffett chose Alice Schroeder to be his biographer, granting her access to his personal life like no outsider has ever been granted. In The Snowball, she is rather frank and is not always complimentary of the investing legend, which has apparently led to a rift between the two. Here follows a summary of the book. These chapters cover Buffett's late childhood and early teenage years. Throughout this period, Buffett held a multitude of jobs, some entrepreneurial and some as employee. Buffett worked in his grandfather's grocery store, in a couple of hard-labour warehouse/delivery jobs, as a golf caddy and in a bakery. He learned early that hard labour was not for him. The job that earned him the most money was that of a newspaper delivery boy. He had accumulated earnings of $1000 by age 14, mostly by delivering papers. He would find ways to be more efficient on his route (for example, by folding the papers a certain way, he could roll them downhill to the customers' front doors by just tossing them from the street). Delivering papers in this manner brought him a higher salary than that of his schoolteachers! One of his most successful entrepreneurial ventures involved pinball machines. He would buy these used machines for $25, get them repaired up by his friend, and then convince a barber (with a 50-50 revenue split) to let him keep it in the shop. This was the kind of high ROIC business that Buffett loves, for the profits from one machine provided the capital for a multitude of future machines. While Buffett was setting himself up as a terrific businessman, the author paints a different picture of his personal life. After his father was elected to Congress, Buffett had to move from Omaha to Washington, which displeased him greatly. He lost many of his friends and hobbies, and as a shy child that wasn't a great athlete and that put no effort into how he dressed, it was a difficult adjustment. His grades started to suffer, and he fell in with the wrong crowd. For a while, he stole regularly from the local Sears, and played pranks on his teachers and others. At one point, he even shorted the stock of a company in which the teachers' retirement savings were invested, just to show them the stock slips. At one point, his father had a talk with him about his unruly behaviour and expressed disappointment that his bright child was not living up to potential. He threatened to take away Buffett's paper route, but more than anything it was Buffett's fathers disappointment that got to Buffett.